On each side of the fish, make three diagonal cuts 2 1/2 inches long and about a 1/2 inch deep. Stir the marinade ingredients in a small bowl and spoon it over the fish, making sure it seeps into the cuts. Let the fish stand in the marinade uncovered at room temperature for 1 hour. Preheat the oven to 400 degrees Fahrenheit. Melt the butter in a small skillet, and saute the sesame seeds until golden, 1 minute. Stir in the ginger and garlic; cook 1 minute. In a small bowl, combine the soy sauce, lemon juice, cornstarch, and water; stir until smooth. Stir this into the butter mixture, and heat to a simmer stirring frequently. Cook until slightly thickened, about 1 minute. Set aside and keep warm. Arrange the fish in a baking pan, and bake until it flakes easily, about 20-25 minutes. Stir any accumulated pan juices and the chopped scallions into the sauce. Spoon the sauce over the fish or serve alongside. Posted on December 6, 2011, in Seafood and tagged asian cuisine, fish. Bookmark the permalink. 2 Comments. That looks delicious. 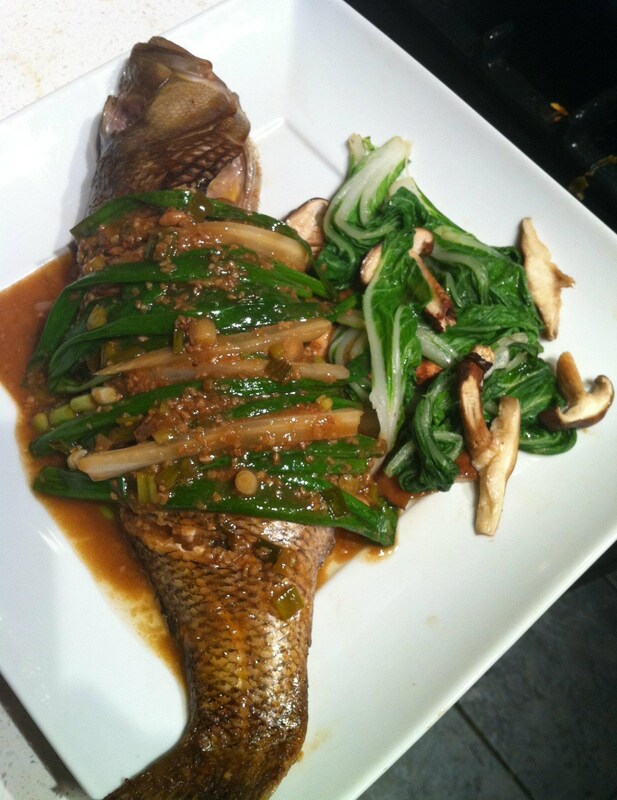 I did a couple of sea bass stuffed with Chinese mushrooms and spring onions as part of an oriental feast. See my most recent blog “who the hell is Lord Padington.” Yours looks really tasty. Bok choi is so nice with fish.